From centuries Tuscany is home of furnaces and factories, custodians of an ancient tradition and famous for pottery and the creation of fine majolica. Ever since the '200 the craft of potter is very popular in Florence and the artisans who work the "lands" haven't a own Corporation, but they are a part of the Art Guild of Doctors and Apothecaries. The workshop of Luca della Robbia is already active in Florence in 1445 and produces glazed earthenware with a special enamel gloss, which makes the colours resistant to cooking and of which still has not been possible to identify the composition. 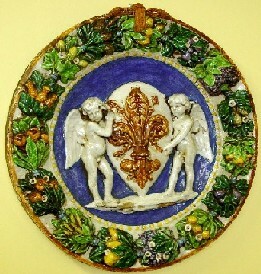 In the fifteenth century, also the Medici family produces and collects pottery and ceramics and in 1737 the Marquis Ginori opens in Doccia (Sesto Fiorentino) the production of porcelains, creating the first Italian industry of this kind, that produces precious ornaments and pottery , until 1896 when it will be called Richard-Ginori. As evidence of this past in the historic downtown there are still some streets with related names: "Via della Fornace (Way of the Furnace)", "Via dei Serragli (Way of the Menageries)" and "Via della Mattonaia (Road of the Bricks)"
The ceramic industry is still considered among the most important Tuscan artistic crafts. Current production consists of several kinds of artifacts and artisans, working with the most ancient Tuscan traditions, shaping the material with the steady recovery of traditional forms and colours. In the process, every detail has been jealously handed down: the choice of lands, the application of enamels, the processes of aging and patinas.